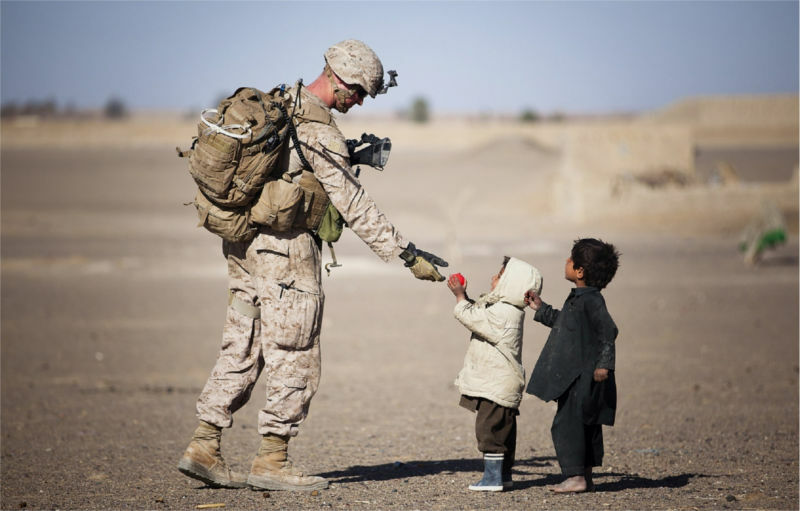 Many children have one or both parents in the military. These children may not know that more than 2,300 U.S. military have died, but they know fear and loneliness. Children want to trust God but war is confusing. Assure your students that it’s okay to ask questions about the pictures on TV. Encourage them to talk about their feelings and you’ll hear questions like these. . .
Q: Why does everyone hate us? Children need to know that not all “holy books” are the same. In many ways the Bible and other “holy books” are opposites. They both cannot be true. Read 2 Timothy 3:16 with your students. Challenge them to believe the Bible is God’s Word. Q: Will the bombs hit me? “Trust God to keep you safe. He has promised to watch over you” (Ps. 145:20). Stop and celebrate the protection God gives you. Children tend to personalize what they see and hear. When they hear that a bomb blew up a house they may run to the window to see. Use a map to show children how far away the fighting is from their city. Talk about all the people God has provided to take care of them: parents, policemen, firefighters and neighbors. Assure your students you are there for them too. Q: Why does God let war happen? Wars are dreadful but God is still doing good things in peoples’ hearts. Families draw closer as they pray together for loved ones in uniform. Military chaplains conduct worship services on battlefields where soldiers receive Jesus as their Savior. Q: Are the soldiers scared? “Yes, sometimes adults get scared. But soldiers who have put their faith in God can be sure He is with them” (Ps. 23:4). Don’t tell children that everything will be okay because we can’t know that. Soldiers do die and their families grieve. Help children know that when they cry God sees them and understands their fears. Throughout the Bible God told leaders such as Moses, David, Deborah and Joshua to have courage during war. Read Joshua 1:9 with your class and discuss ways they can show courage. Q: Will we win the war? “People have different ideas of what it means to win a war. As Christians we are winners every time we choose to live in peace with others” (Matt. 5:9). Students can write letters of encouragement to the President, to soldiers and to children whose parents are deployed. Older children can make a scrapbook of news clippings and pray for children in the photos. Even if they don’t know the children by name, God will hear their prayers. As you model your faith in God, you give students hope for a better future even when their country is at war.